EF Commander is a complete file manager for the Windows. If you've ever used and liked Norton Commander, you'll like this dual-windowed program, which comes complete with bubble and online help. You can search directory trees and directories and perform actions, including Run, on files. You can also check file attributes and edit files with search-and-replace and drag-and-drop. Use the internal editor or associate one of your choosing to edit files, easily view files and configure the buttons to suit your needs, and get system and disk information with a click of the mouse. GpSoft Dir Opus still King! Has it all and then sum! Much better than Total Commander. Easy to create a new folder, and the 64-bit version a lot faster than Total Commander on my 64-bit Windows 7 machine (even though TC is 64-bits, too !). I like minor, but useful features, such as the current time display and a "Kill Process" button. Little things can add up to big things. An up-date on my previous review. 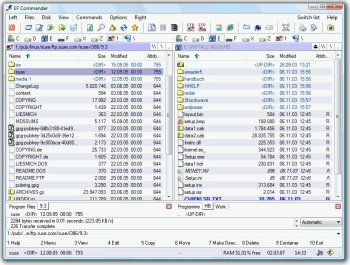 I recently moved to Windows 7 and wanted a "native" Windows 7 X64 file manager. After an extensive review I chose xplorer2 (http://www.zabkat.com/). Same price as EF Commander but for me is much simpler and easier to "tune" to my way of working. 3 stars for this but 5 stars for xplorer2. if it doesn't have at least 5 rows of icons, it's not worth it, so a low rating from me. bubble help and online help is so useful, especially for people like me who's been using computers since Spectrum days. Lovely jubbly. It's not a 10MB file manager at least. 2 stars for that. Why not "EF Commander Free"? Is actual, not from another century, runs on Vista, is absolutly free, no nags, no donation buttons. Why not use the older but free version of Servant Salamander 1.52 (see: http://www.altap.cz/download.html#salrel). I've been using this for years and find it indispensable. 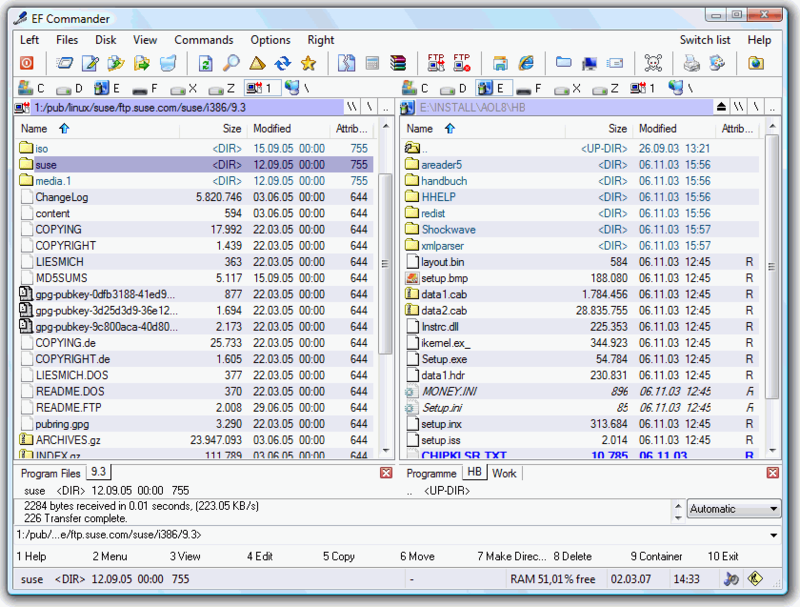 If you must have the latest versions then purchase Altap Salamander 2.51 for half the price. @jcunews: All "Commander" programs include your favorite are clones, all clone the old Norton Commander. This program, former "PM Commander", "Commander", "Commander 2001", "CHIP Commander" and "File Commander", run since February 1994, all what you wrote is not true! have your favorite internal Audio Player? NOT! 22 internal Packers? NOT, etc. This is just a Total Commander clone - including the license. A shareware that is. But unfortunately, it's half as solid as Total Commander. So why use it? 1999 called, it wants its endless rows of tiny unlabeled and ambiguous icons back. @ previous comments. perhaps testing the lite version would be less annoying? Nice app. Far less flakey than Explorer file manager. The other day I downloaded EF Commander to check it out and put it through its paces. After only a half hour of use the nag screen(s) had appeared so many times I was forced to abandon this endeavor. Not only did the nag screens come up repeatedly but I was also bumped off the program several times. I became so frustrated with the software I uninstalled it from my computer. In the short time I was able to use it I could see it had a number of nice features I wanted to check out further, but the nag screens were just too much to deal with. I wrote the manufacturers of the program complaining of the aggressive nature of their nag screen and received a curt responce that said he had been in business for 25 years and he knew what he was doing. He further stated that ten minutes was really all the time needed for evaluation to see if you want to buy the product. Increduously I wrote him back saying that 10 minutes isn't enough time for anyone to properly evaluate ANY piece of software, and that his marketing strategy was badly flawed. He wrote me back reiterating what he said before. With an attitude like that I guess he feels he has a big enough share of the Windows Explorer replacement market. It is a crying shame that I could not play with this program without being bothered every other minute by a damn nag screen. So be it.....two stars for you! Has anybody ever tried to use this "commander" as the windows shell? Would be nice to know. Anyway, I've tried it, but don't find it as useful as "Total Commander". It's not at all bad - just not up to the standard "Total Commander" has reached throughout the decades . . .
And remember: "DON'T PANIC - read the Hitchhiker's Guide through the Universe"
Best file Commander I ever used! Give it a try! I am using this now for several Months and all updates / upgrades are FREE and will stay free for customers. Nice! Is a nice File Manager. look like the old Norton Commander hehe... But i'll include tabbed option like a Total Commander File Manager in the next version. EF Commander is the best damn commander out in the field. I've been using it for years. This one definitely is worth to register!